Smart Product Technology makes a kit to turn several of your bottom stairs into a hidden lift-up door. This kit allows you to reach the area underneath the stairs, or space inside the actual framing of the stairs. 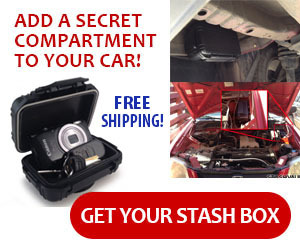 This can be used for storing guns and valuables. 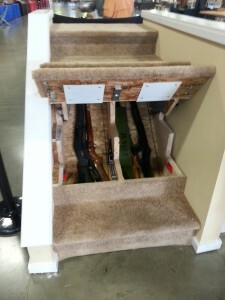 SPT makes the kits for any standard constructed wooden stairs that are carpeted. They come with everything needed to install, including hinge mechanism, gas struts and a metal undercarriage.